OnePlus has started pushing out a new update to its 5 smartphone. 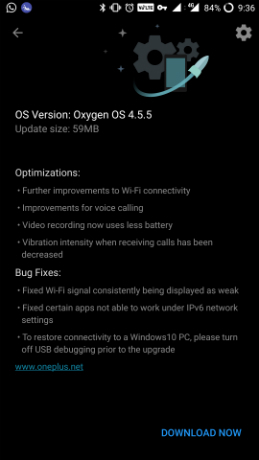 Arriving as OxygenOS 4.5.5, the update weighs in at around 60MB, and brings optimizations and bug fixes, but seemingly no new features. Wi-Fi connectivity has been improved and voice calling has been made clearer. Other optimizations are related to video recording (which now consumes less battery) and incoming call vibration intensity (which has been turned to a gentler level). The issue which caused Wi-Fi signal to consistently being displayed as weak has been resolved. So is the one related to certain apps that were not able to work under IPv6 network settings.